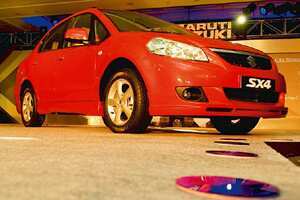 Mumbai: India’s biggest car maker Maruti Suzuki India Ltd said sales gained 5.3% in September, helped by demand for its sedans and higher exports. Maruti sold 71,000 cars, vans and sport utility vehicles (SUVs) in September from 67,448 a year ago, the New Delhi-based unit of Suzuki Motor Corp. said in a statement on Wednesday. Sales of SX4 and Dzire sedans grew 52% in the month to 7,413 units. “Companies are sending stock to the dealers’ end ahead of the festivals," said Mayur Milak, a Mumbai-based analyst at Alchemy Share and Stock Brokers Pvt. Ltd. “But many people are postponing purchases as interest rates have gone up from 14.5% to 15%." More than half the vehicles sold in the country are bought on credit. Maruti’s domestic sales gained 2.5% in September to 64,682 units. Exports in the month rose to 6,318 from 4,362 in the year-ago period, the firm said in the statement. Mahindra and Mahindra Ltd (M&M), India’s biggest maker of SUVs, said sales in September rose 28%, boosted by demand for its Scorpio SUV and three-wheeled vehicles. M&M sold 25,427 cars, SUVs, trucks and three-wheeled vehicles last month in India and overseas, compared with 19,895 a year earlier, according to a statement posted on its website on Wednesday. Exports fell 27% to 946 units. Tractor sales last month fell 6.8% to 8,082 units from 8,668 a year earlier, it said. Hero Honda Motors Ltd, the country’s biggest motorcycle maker, said its September sales “can’t be less than 100,000" as the company sold more than three times that last month. “Our sales can’t be less than 100,000 a month," spokesman Bharatendu Kabi said by phone. CNBC-TV18 had earlier reported that New Delhi-based Hero Honda sold 94,181 vehicles in September, without saying where it got the information. Bajaj Auto Ltd, India’s second biggest motorcycle maker, said sales rose 5.5% in September on higher exports. Sales of motorcycles, three-wheeled auto rickshaws and scooters rose to 245,381 last month from 232,496 a year earlier, the Pune-based company said by email on Wednesday. That included exports of 68,572 units, a gain of 43%. Bajaj’s motorcycle sales rose to 217,365 units in September from 204,152 a year ago, the company said. TVS Motor Co. Ltd, the third biggest motorcycle maker in the country, said it posted a 19% growth in September two-wheeler sales, helped by an increase in sales across all models. Total two-wheeler sales for the month were at 137,246 units, against 115,091 units a year ago. The company’s motorcycle sales grew 32% to 71,278 units from 53,991 units. However, scooter sales dropped marginally to 27,108 units, against 27,199 units during the same period in the previous year. Exports rose 40% to 18,229 units in September, against 13,036 units last year.